*PRINTS IN ALBUM #1 AND ALBUM 'B' - DATE 1888 - NOTE LENGTH OF GRASS, see PN5839 - HOUSE NO LONGER STANDING. SEE ALSO AMNH #24,481 FOR SAME VIEW. *POLE AT EXTREME LEFT, MOUNTAIN GOAT MORTUARY POLE, ERECTED IN HONOUR OF CHIEF SKEDANS. CRESTS ARE: MOON; MT. 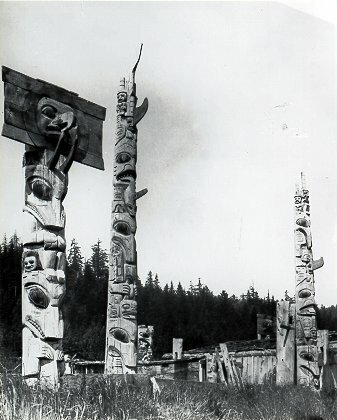 GOAT, GRIZZLY BEAR ,ERECTED BY PREDECESSOR OF PRESENT CHIEF OF THAT NAME BY ONE INTERMEDIATE REPRESENTITIVE -SKIDEGATE MARRIED TO SISTER OF THAT DISTANT CHIEF AND HE AND HIS WIFE TO DO HONOUR TO SKEDANS DURING HIS LIFETIME ACCUMULATED MONEY AND GIFTS AND GAVE A GREAT POTLATCH DURING WHICH THE POLE WAS RAISED INTO PLACE : INFORMATION FROM : NEWCOMBE TRANSFER CASE OF Q.C.I.